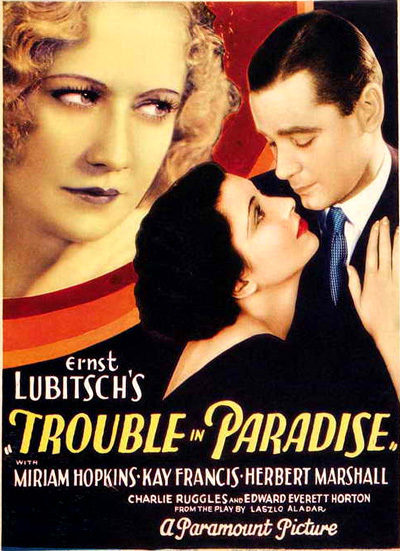 Trouble in Paradise (1932) is generally considered producer/director Ernst Lubitsch's greatest film - and his own personal favorite of all his works. The screenplay by Grover Jones and Samson Raphaelson, about a pair of sophisticated thieves (played exquisitely by Herbert Marshall and Miriam Hopkins), was based on the play The Honest Finder, by Aladar Laszlo (incorrectly transposed in the credits). The two swindlers travel together from Venice to Paris, where they competitively target the wealthy, female owner (Francis) of a perfume business for their next heist by both becoming her confidante-secretary and assistant secretary/maid. Romantic entanglements jeopardize their larcenous plans. This treasured comic film masterpiece, a pinnacle of sophisticated romantic comedy, beautifully epitomizes the "Lubitsch Touch" with its flair for pre-Hays Code sexual comedy, witty innuendo-filled, suggestive dialogue, orchestrated grace and charming style, subtle use of details, and sardonic humor. Lubitsch's Trouble in Paradise was his first non-musical sound comedy. The "trouble in paradise" - soon to be revealed - is embodied in the form of two masquerading, international jewel thief-swindlers/crooks (and former lovers) who practice their deceptive occupation among the upper-class elite of European society from Venice to Paris - the two foreign locales in which the film is set. The film has two sections - beginning with a fairly brief prologue in Venice. It opens with a realistic view of a back porch in a dark, back alley with brick walls, a garbage pail by a door, and a dog sniffing at the trash. An ordinary garbage collector enters from the right of the frame and picks up the can. As the camera follows him, he carries the garbage can to the side of a Venetian canal - the first identification that the setting is Venice, and dumps the garbage bin onto the heap already forming on his gondola. [The film deliberately contrasts appearance with reality - the normally-romantic, glamorous setting of canals in Venice is really the setting for the mundane collection of garbage.] As he pushes off, the gondolier's voice breaks out singing in the film's first musical introduction. He sings, a capella, a romantic barcarolle titled "O Sole Mio" (in the voice of famous Italian tenor Enrico Caruso). Inside a darkened hotel room closeby, the doorbell rings impatiently, the figure of a man flees over a balcony, and casts a suspicious shadow on a lower wall (as the man removes a facial disguise). The camera pans back to glimpse the legs of a body lying on the floor. A crime has been committed. Two Italian women (prostitutes) at the door wonder to themselves why no one is answering and letting them in. The semi-conscious man struggles to pick himself up from the floor. Waiter: Yes, Baron. What should we start with, Baron? Hmm? Gaston: Oh yes. That's not so easy. Beginnings are always difficult. Gaston: If Casanova suddenly turned out to be Romeo having supper with Juliet, who might become Cleopatra, how would you start? Waiter: I would start with cocktails. Gaston: "It must be the most marvelous supper. We may not eat it, but it must be marvelous." Gaston: "You see that moon?" Gaston: "I want to see that moon in the champagne." Waiter: (repeating) "Yes baron. Moon in champagne." The waiter removes a tiny leaf that has adhered to Gaston's clothing - his successful thievery has left a tell-tale sign. A telephone switchboard operator receives a call from Room 253/9 of the hotel - the word is quickly spread from the manager to hotel employees that there has been a robbery in royal suite 253-5-7-9 (four rooms made into an ultra-luxurious, expensive suite only affordable by the wealthy). Lily: You know, when I first saw you, I thought you were an American. Lily: Someone from another world - so entirely different. Oh! One gets so tired of one's own class - princes and counts and dukes and kings! Everybody talking shop. Always trying to sell jewelry. Then I heard your name and found out you were just one of us. A telephone call for the "countess" unmasks her pretentious, but glorious show of social elitism. Although she appears to be engaged in a high-society conversation with the Dutchess of Chambro, the camera cuts to a view of the caller - an unkempt older woman in pajamas who complains about Lily's dog. Following the call, Lily complains to Gaston about how "the scandal is on" already, and she collapses on the sofa. In another part of the hotel, police and hotel managers have gathered to interrogate Monsieur Francois Filiba (Edward Everett Horton) and reconstruct the robbery. The absurdist scene, in which the camera pans back and forth between the Italian police and the robbery victim, is half-played in Italian. As Filiba explains how he was knocked out and robbed of 20,000 lira by a fake, mustached/side-burned doctor who appeared at his door, his words are excitably translated and elaborated upon by the hotel manager to a group of equally-astonished and excitable Italian policemen. Hotel Manager: The representative of police would like to know if there is anything wrong with your tonsils, Monsieur Filiba? Hotel Manager: What did you talk about, Monsieur Filiba? Hotel Manager (to Police): Tonsille! The Chorus of Police: Tonsille! Filiba: So then I said to myself, all right, if he wants to look at them, let him look at them. There's no harm in that. Then he said, 'Say 'AH!' And so I said, 'Ah!' And that's all I remember. When I woke up, I still had my tonsils, but my pocketbook was gone. Gaston: That's hotel life. In one room, a man loses his wallet, and in another room, a man loses his head. Lily: Please! When I came here, it was for a little adventure, a little game which you play tonight and forget tomorrow. Something's changed me; and it isn't the champagne. Oh, the whole thing's so new to me. I have a confession to make to you. Baron, you are a crook. You robbed the gentleman in 253, 5, 7, and 9. May I have the salt. Gaston: (as he passes the salt) Please. Gaston: You're very welcome. Countess, believe me, before you left this room I would have told you everything. And let me say this with love in my heart. Countess, you are a thief. The wallet of the gentleman in 253, 5, 7, and 9 is in your possession. I knew it very well when you took it out of my pocket. In fact, you tickled me. But your embrace was so sweet. Suddenly, Gaston leaves the table to lock the door, pocket the key, and pull the curtains. He then pulls nimble-fingered Lily up to her feet and grabs her by the shoulders, appearing to be overcome with passion. But he does the unexpected - he violently shakes her like a rag doll - until the wallet, in a close-up of her feet, falls to the floor from under her dress. He pockets the wallet and graciously re-seats her at the table. Her theft of his wallet initiates their affair together. Lily: I like you, Baron. Lily: (after suddenly noticing she's missing it) Thank you, Baron. Gaston: Not at all. There's one very good stone in it. Lily: Darling! (excitedly, she rises and kisses him, flinging herself into his arms) Oh now, darling. Tell me, tell me all about yourself. Who are you? Gaston: You remember the man who walked into the Bank of Constantinople, and walked out with the Bank of Constantinople? I love you. I loved you the moment I saw you. I'm mad about you. My little shoplifter. My sweet little pickpocket. My darling. The couple's images slowly dissolve, and magically vanish and disappear, leaving an empty sofa in the twilight. The room's light is switched off, and a sign is hung on the door: "Do Not Disturb." The camera lingers for a moment or two on the door, a subtle suggestion of what might happen next. A view of the singing gondolier/garbage collector moving through the narrow canal ends the opening sequence in Venice. The remainder of the film's narrative is set in Paris. In the next scene, a clever transitionary scene from Venice to Paris, a Morse-Code like radio-transmitted signal is beamed from the top of a technology-transformed Eiffel Tower (viewed at night) - the signals shoot out like bolts of lightning (similar to the RKO Pictures opening trademark). The Paris police reporter in the comically-exaggerated radio broadcast (a program sponsored by Colet & Cie, manufacturers of perfume) announces that in Geneva, "the famous international crook Gaston Monescu robbed the Peace Conference yesterday. He took practically everything except the peace." The police arrested him and confiscated the stolen goods, but he managed to escape "in an inexplainable manner." The newscast connects the first section of the film with the second. Remember, it doesn't matter what you say, it doesn't matter how you look, it's how you smell. - a wall with a sign advertising "Colet & Cie, Paris, Parfumeries"
Unfortunately Monsieur Giron, business bores me to distraction. Besides, I have a luncheon engagement, so I think we'd better leave the salaries just where they are. Goodbye.